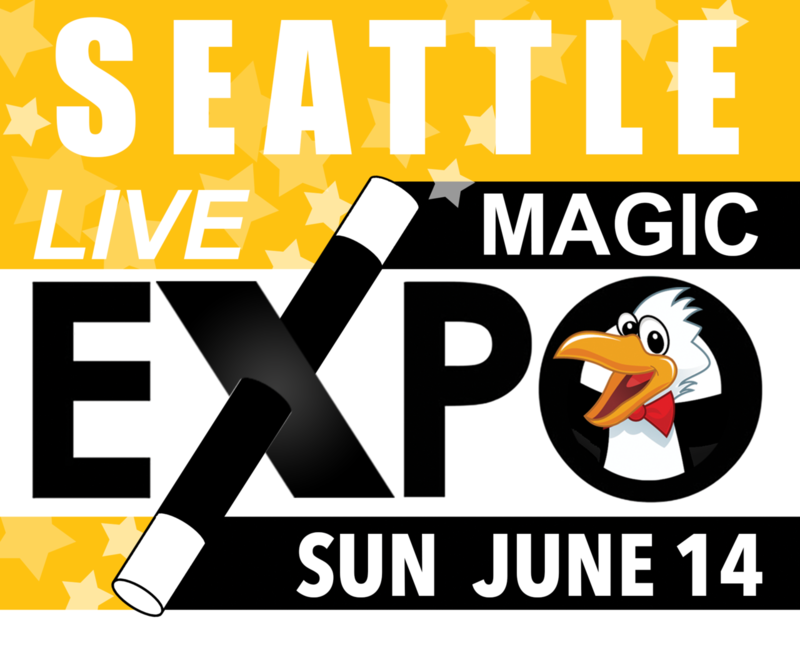 Today, when you order "Seattle 2015 LIVE MAGIC EXPO: Sunday, June 14th", you'll instantly be emailed a Penguin Magic gift certificate. You can spend it on anything you like at Penguin, just like cash. Just complete your order as normal, and within seconds you'll get an email with your gift certificate. 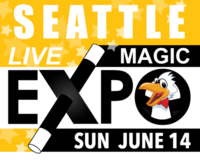 Seattle 2015 LIVE MAGIC EXPO: Sunday, June 14th (Registration) See and buy magic you won't find anywhere else. Not even online! RESERVE TODAY AND GET A $10 VOUCHER AT THE DOOR. We're coming to Seattle on June 14th and we're bringing the world's best magic creators with us! With Magic Magazine, SAM and Penguin Magic as sponsors, you know it's going to be a good time. I really enjoyed the expo, and it appeared to be a success. I met three magicians whom I had never met before - pros at the top of their game. A fantastic, fun learning experience. Cons: There weren't enough seats for the mini-lectures, but I realize that was due to a space restraint. If you happen to be in a bigger room, add 3 or 4 more rows of chairs. Also, name badges would have been nice - even the stick on ones. I saw a lot of people I recognized but didn't know their names. 22 of 23 magicians found this helpful. I did some amazing magic with some of the best magicians I know if you do magic go to this. I met a lot of new friends and I performed by the greatest. This is one of the coolest things you can do! 20 of 22 magicians found this helpful. I thought the Magic Expo was GREAT. The performers were top-notch, very helpful and had some incredible effects for sale. It was well organized and a lot of fun. Keep up the Super Work!! !.........and PLEASE return, Soon. 16 of 17 magicians found this helpful. This live event was awesome. Well structured and well paced. I'm sure alot of work was put into this even. I look forward to the next event in Louisville. Great to talk with a variety of magicians and gain insight and techniques to performing the tricks purchased. Hats off to all of the sponsors and awesome job Brent Braun for your work. Mark Mason, I hope you got some rest!!! 15 of 16 magicians found this helpful. This was the most fun that I have had in a while. It was a privilege getting to meet some big names in magic and watch them demonstrate/teach their effects. I am already looking forward to the next expo! 14 of 15 magicians found this helpful. It was an awesome day - the chance to meet and discus magic with some of the greatest minds in magic. The chance to see effects you can't see anywhere else. The opprotunity to network and chat magic with old and new friends. I would highly recommend this evernt for those who share a genuine interest in magic. The Louisville Penguin Expo was perfect in every way! If the Penguin Expo is coming to your city and you haven't decided if it's for you, then let me assure you... It really has something that everybody needs. The magicians in attendance were fantastic, and varied enough that there really wasn't any overlap of material. If you like coin magic, mentalism, prop magic, cards... It was all here. Every effect was performed at request, each effect was available to hold and determine if it was something you needed. Not that that was even necessary, because everything available there was awesome. The special guests were always ready to talk, explain, help. This is the kind of expo you'd expect to pay at least 5 times or more what you pay for admission, and the attention you receive is amazing. Plus the mini lectures were wonderfully educational and entertaining! I brought my family and they were thrilled the whole time. GO TO THE PENGUIN MAGIC EXPO's! 13 of 14 magicians found this helpful. A wonderful experience, can't wait for next time! 12 of 15 magicians found this helpful. Did the SEATTLE EXPO last Sunday and had a great time. Lots of action at the booths, but Brent, Mark, Paul, and Chris were fantastic as lecturers, with a more than just demonstration presentations - each had bits and byplay beyond the bottom line. Frankly, I feel it takes that kind of interaction to more fully understand an effect's potential versus a one shot video demo. Each presenter was allowed 3 effects. Mark Mason demo-ed: No-Tear 2, and the brand new Under Wraps and Block Buster, each with his signature audience byplay. Paul Richards presented iBalance, Huego, and his supplemental handling of Johnny Wong's Double Face Super Triple Coin. Each, as well as everything else from Paul since he sold Elmwood, is only available via live events, so another big plus for attending the EXPO. Chris Smith demo-ed his MagicSmith products: Ignition, as well as showing how Big Bang and Lightning could work well together in addition to each as a separate effect. Brent Braun presented Sticky Situation, Bill Breaker, and Psypher, each with a special emphasis on the situational switches that make the effects outstanding. Penguin provides a Watch/Learn/Discuss forum for products bought through the web-site, however, there does not appear to be any mechanism to join those forums if you "Buy Live." You are not quite sure who you will get. I know Penguin/Brent can't fully control people's schedules and availability, but several of the attendees I knew mentioned they were expecting some other vendors. There was no representation of local clubs and other organizations. There were a lot of people present who we have never seen at a meeting, convention, lecture or other event in the area. Now that IBM is a sponsor of the EXPOs, perhaps a corner could be provided for local clubs to allow an transition opportunity for some of these "internet magicians" to build live networks. 9 of 10 magicians found this helpful. The Expo was GREAT! All of the magicians were really nice, and weren't pushy about you wanting to buy their stuff. The lectures were really great. I bought a total of 6 items, and the place wasn't crowded, and it was big and spacey too! If you were there, I was the kid who got up to volunteer for the one that Chris Smith did, where he put an X on his hand with a sharpie, and then transferred it to my hand. It was a great expo, and I hope to see it next year! 15. Light It Up Midn..